FRISCO, Texas (AP) — Ezekiel Elliott still had five more games to watch last year after the Dallas Cowboys lost in Atlanta at the beginning of their star running back’s six-game suspension over domestic violence allegations. 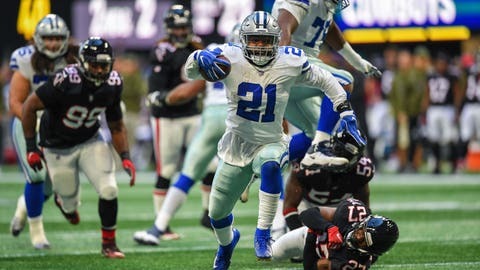 After playing a huge role in helping the Cowboys thrust themselves into the NFC East race with a win at the Falcons, Elliott will be right in the middle of trying to get them back to the playoffs instead of having to watch a season go south without the 2016 NFL rushing champ. It’s quite a two-game streak to build on for Dallas (5-5): road victories over the past two Super Bowl participants from the NFC, before which the Cowboys were winless away from home and teetering on playoff extinction just halfway through the season. And it set up a Thanksgiving showdown against Washington (6-4) on Thursday with the division lead on the line. Both victories featured winning drives to answer tying fourth-quarter touchdowns — first against defending champion Philadelphia . The Cowboys actually answered two tying TDs in the final quarter against the Eagles. Elliott had two of his five 100-yard rushing games and combined for 388 yards from scrimmage and three touchdowns in wins over the Eagles and Falcons. Instead of wondering what they’ll do without that kind of production, the Cowboys are feeding off growing confidence in an offensive line that is finally absorbing changes and the residual benefits of new No. 1 receiver Amari Cooper, acquired in a trade when Dallas was 3-4 going into its open week. Prescott was sacked a career-high eight times in his first game without Elliott last year against the Falcons, the start of a three-game losing streak. Although the Cowboys won the final three without their running back, the margin for error was gone. A loss to Seattle in Elliott’s return eliminated Dallas a year after Prescott and Elliott led the team to an NFC-best 13 wins. The reward for the current two-game surge is three straight home games, although one-loss New Orleans is the middle opponent. After an extended break following the Saints game, the Eagles visit. Philadelphia’s hopes of a repeat are fading coming off a blowout loss at New Orleans. The formula from the two road wins seems to be the best hope for the Cowboys. The defense keeps them in games, as it has done several times this season, while the offense makes the winning plays late. One of the fourth-quarter TDs against Atlanta was set up by rookie linebacker Leighton Vander Esch‘s second interception in as many games.